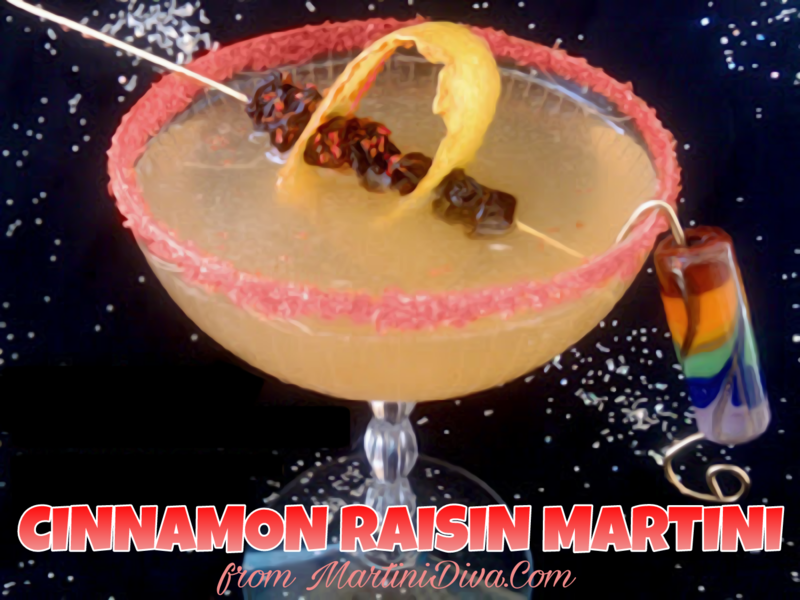 When I think cinnamon I think raisins so I thought I'd give that flavor combo a whirl as a cocktail. I received a bottle of Pinnacle's Atomic Hots® Vodka for review and decided this was a great use for it. This is a pretty perky cinnamon liquor so I decided to tame it down a bit with some lemon juice and muddle in some raisins to add a little mellow sweetness and richness. After I tasted this combo I decided it did need a bit more sugar so I added the red sugar rim. I almost added cinnamon in the sugar rim but the Atomic Hots vodka doesn't need any help in the cinnnamon department. Rub a slice of lemon around the rim of your glass then dip the rim into the red sugar. Chill your martini glass in the freezer. Muddle the raisins in lemon juice in the bottom of your cocktail shaker, pour in a cup of ice cubes, add the cinnamon vodka and shake until well chilled. Pour into your chilled martini glass, add a twist of lemon then skewer a few raisins on a cocktail pick and drop in and enjoy! *If you can't find the Atomic Hots you can substitute another cinnamon flavored spirit but you might have to adjust for balance.